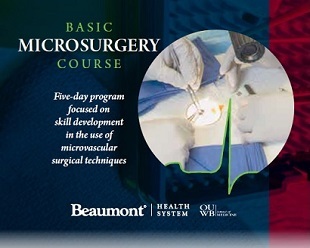 A five-day program focused on skill development in the use of microvascular surgical techniques. A five-day program focused on advanced skill development in the use of microvascular surgical techniques. Mindfulness-Based Stress Reduction is an 8-week course that was developed in 1979 by Dr. Jon Kabat-Zinn. In MBSR, you will learn to access and cultivate your natural capacity to actively engage in caring for yourself and find greater balance, ease and peace of mind. Mindful Self-Compassion (MSC) is an 8-week course that was developed to combine the resources of mindfulness and self-compassion to support emotional wellbeing. This course consists of weekly 2.5-hour sessions and a 4-hour "retreat" between weeks 5 and 6. Sessions include guided mindfulness practice, brief presentations of relevant topics, plus dialogue and inquiry regarding experience with practicing self-compassion. Recent developments in treatment and outcomes of out of hospital cardiac arrest have shown issues with consistent implementation of best practices. This program will narrow these gaps. This educational activity will offer the primary care clinician practical approaches to the management of contemporary issues encountered in today's clinical populations. The conference has been designed to offer options for the attendees to obtain information most relevant to their individual practices by offering workshop choices. 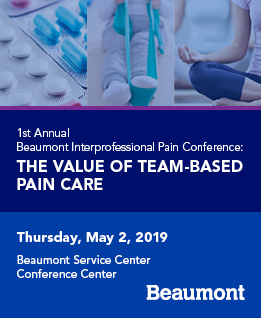 The Beaumont Health Interprofessional Pain Conference will cover the importance of team-based care and coordination for the safe and effective treatment of pain. Current topics in Pediatric Surgery Sub-specialties. Join Beaumont and their breast care experts for helpful information and in-depth panel discussions. This is an interactive workshop for faculty, staff and students where key concepts associated with inappropriate behaviors will be defined and discussed. This session will outline the importance of a positive learning climate and the impact professionalism has on this climate, both from clinical faculty and medical students. This presentation will highlight current knowledge and strategies to best care for patients with a hearing loss. 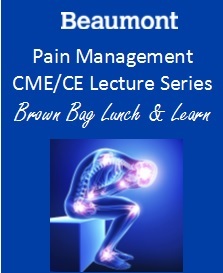 This presentation will provide a basic level of understanding for any healthcare practitioner interested in providing care to this patient population. This session will cover how to utilize PowerPoint to create, prepare, and deliver effective and engaging presentations. This session will cover the historical implications of bioethics, as well as how the Nuremberg Code is utilized and put into practice today. This presentation will cover why it is important for healthcare providers to discuss domestic and sexual violence with their patients and four different tactics clinicians can use to address these issues and provide the best care for their patients. This generation has unique needs when it comes to the process of learning and educational practices, and this session will cover how to attune curriculum and activities to best engage this new emerging generation in medical education. This session will provide clinicians and faculty with a variety of tools and methods they can utilize when they are faced with a challenging learning, including utilizing learning climate behaviors, explaining disagreements, and recognizing when it is time to get help for a challenging learner. This session will cover the Americans with Disabilities Act (ADA) and the different ways in which healthcare practitioners can best support their patients and their care. This program will provide a background on the role of vaccines for individual health, public health and in healthcare settings as well as the different reasons for vaccine hesitancy, including religious exemptions. OUWB Med Ed Week: Treating Young Adults with Autism: What Should We Know? Healthcare practitioners regularly treat patients with autism but may not be aware of how to best support this unique patient population. This presentation will cover the five basic components of a nutrition assessment and provide clinicians with the tools to be better able to assess their patients’ nutrition as it impacts their health. This interactive workshop will explore how coaching tools can be employed in the mentoring relationship to create a more dynamic experience. In this half-day workshop for faculty mentors of medical students, NRMN Master Facilitators will focus on the key mentoring competencies that support effective communication to align expectations, assess student understanding to support project design and implementation, and foster independence to promote productivity. This conference combines cutting edge research with the rich clinical experience of its speakers. This session will stress the importance of a new approach to diversity and inclusion and provide empirical evidence and support for implementation in the healthcare and academic medicine settings. This activity is designed to examine the latest evidence based guidelines, techniques and technologies to enhance learner competence through the discovery of new strategies and to develop clinical skills that improve patient outcomes. Each forum will feature staff-led presentations of work that represents a positive shift towards a culture of patient and family centered care. All employees at Beaumont have an impact on the patient experience, so we want to hear from all departments at all sites! Sharing our experiences and learning opportunities is vital as we continue working towards becoming the national leader in patient and family centered care.